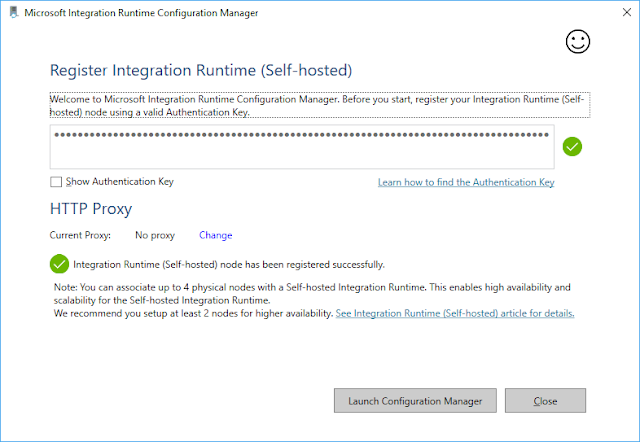 Description: The Integration Runtime (IR) is a customer managed data integration infrastructure used by Azure Data Factory to provide data integration capabilities across different network environments. It was formerly called as Data Management Gateway. 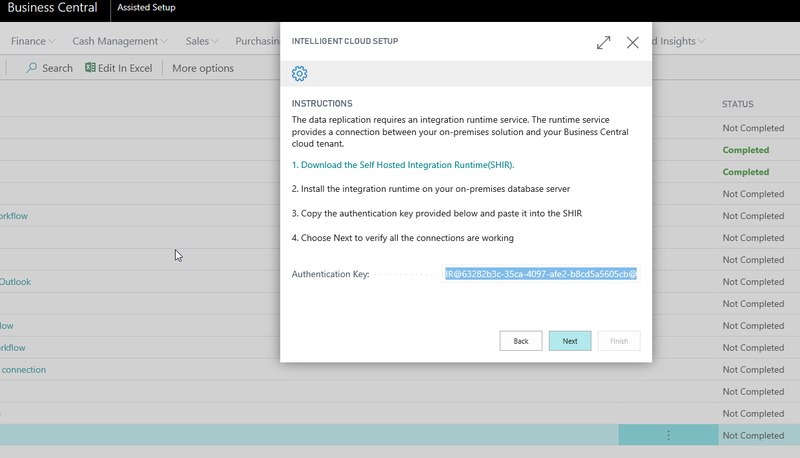 It is used by Business Central and Dynamics GP to provide a one-way data synchronization between your on-premises SQL Server hosting your company databases, and your Business Central tenant data store in the cloud via Azure Data Factory. Running copy activity between a cloud data stores and a data store in private network. Dispatching the following transform activities against compute resources in On-Premise or Azure Virtual Network: HDInsight Hive activity (BYOC), HDInsight Pig activity (BYOC), HDInsight MapReduce activity (BYOC), HDInsight Spark activity (BYOC), HDInsight Streaming activity (BYOC), Machine Learning Batch Execution activity, Machine Learning Update Resource activities, Stored Procedure activity, Data Lake Analytics U-SQL activity, .Net custom activity, Lookup activity, and Get Metadata activity. To install, go to the Assisted Setup page and download the installation file. Copy the authentication key as you will need it for the configuration step. NOTE: Be sure to scroll horizontally to the end of the line while selecting the key text. Launch the installation file to begin the setup process. 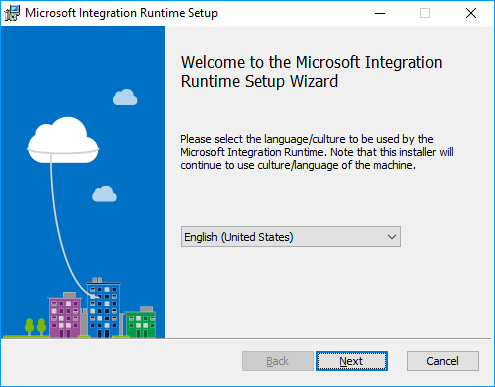 You must first select the language which you will be using with the Integration Runtime. 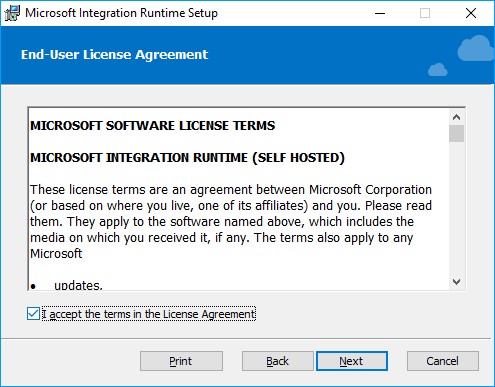 Accept (or not) the end-user license agreement to continue with the installation process. 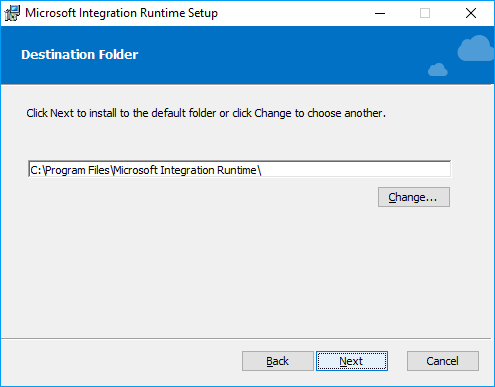 Select the installation folder to host the application files. 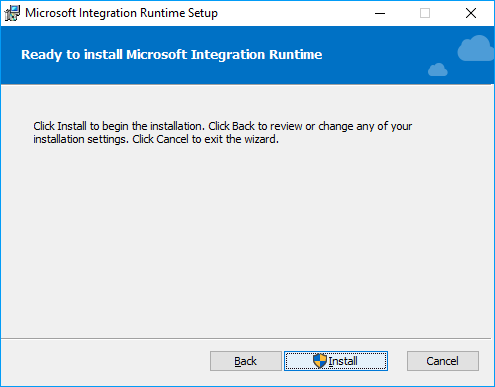 Click the install button to begin the installation process. You may be prompted to run the application with elevated permissions to bypass User Account Control settings on your machine. Once the installation has been completed, click Finish to proceed with IR's configuration. Paste the Authentication Key from step 1. 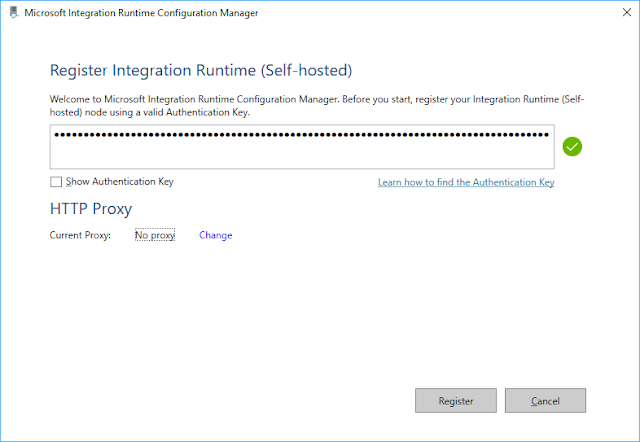 If you require to bypass proxy settings within your organization, be sure to click on the Change link to setup your proxy info. 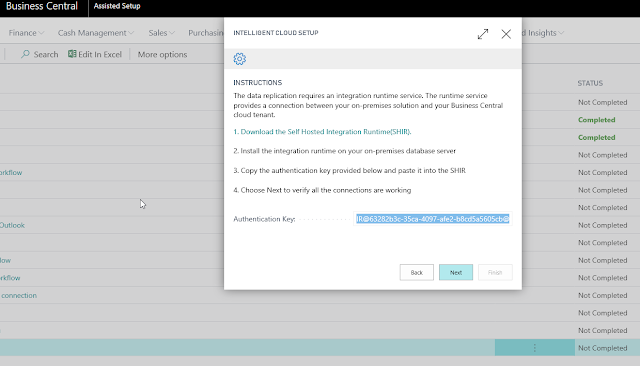 The following screen will allow you to enter the name of the self-hosted node and will display a list of nodes as configured by Business Central on the Azure Data Factory service. 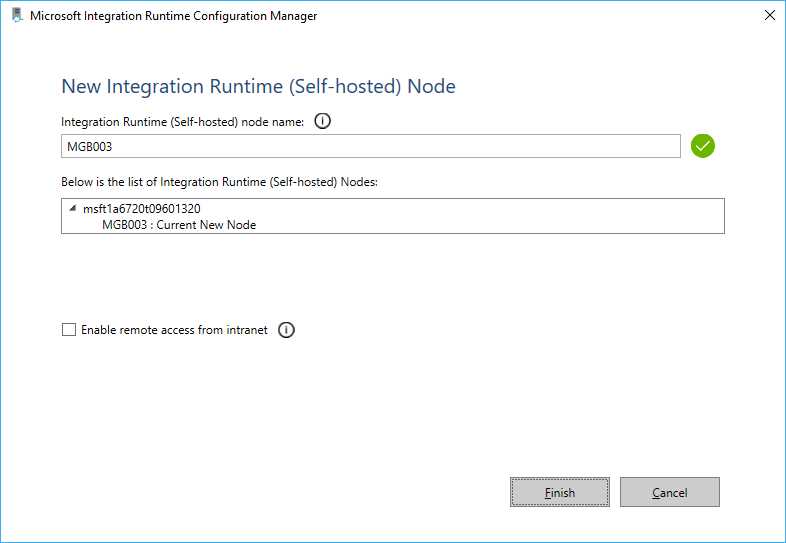 Also, you may enable remote access from your intranet to the integration node. Click finish when done. If you choose to enable remote access for management purposes, you must enter an open TCP/IP port on your firewall. By default, this port is 8060. Should you want to enable secure access to while remoting into the node, be sure to select a certificate. 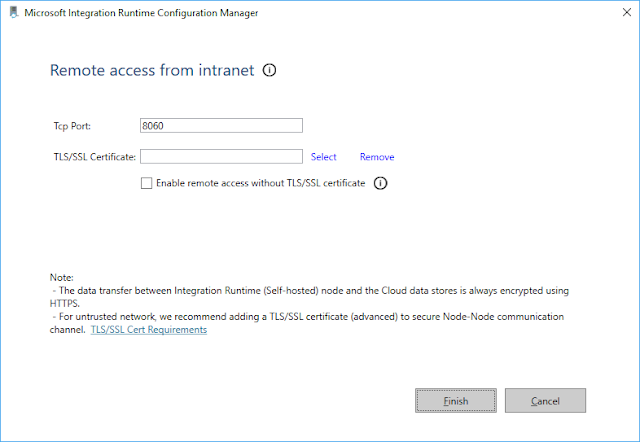 You can also enable remote access without a certificate. 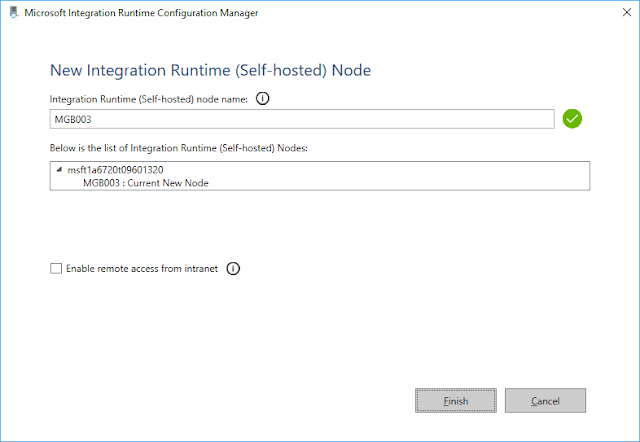 Finally, click on Finish to complete the configuration settings an finalize the node registration process.